The Control Equipment FPM 8000 Facility Protection Monitor is the product of 20 years of research and development in conjunction with military and homeland security authorities. The FPM 8000 is based on highly sensitive nano array technology which is at the heart of the sensor, making it capable of discriminating between gases and identifying target chemical warfare agent gases (CWAs) and toxic industrial compound gases (TICs). It senses 17 predominant THREAT gases used for terrorist purposes. With chemical agents being relatively easy and inexpensive to obtain, a chemical attack is an ever present threat in today’s society. In an effort to be able to credibly detect this threat, Control Equipment Global has invested in years of scientific research to develop a new technology in the battle against terrorism. This research has developed the unique iNAS technology for this purpose. iNAS is an intelligent nano array sensor which can simultaneously detect multiple chemical warfare agents (CWA’s) and toxic industrial chemicals (TIC’s). Utilising this technology, we can now offer the market a truly reliable intelligent gas detection system capable of detecting, identifying and quantifying 17 difference deadly gases that could potentially be used in terrorist attacks. 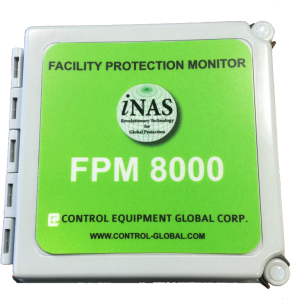 Control Equipment Global’s new Facility Protection Monitor FPM 8000 can be used to monitor ventilation system as well as the local ambient air in the commercial buildings, public spaces such as subways, airports and any other sensitive area. Due to its compact size, its light weight design and its ability to transmit data wirelessly, it can be used in temporarily sensitive locations such as speaking venues where it can be monitored, for example, from a parked vehicle. The FPM 8000 is based on revolutionary highly sensitive nano array technology which is at the heart of the intelligent sensor, making it capable of discriminating between gases and identifying target chemical warfare agent gases (CWAs) and toxic industrial compound gases (TICs). It senses 17 predominant THREAT gases used for terrorist purposes (5 CWAs and 12 TICs). Each THREAT gas is identified and its concentration is measured by the intelligent nano array sensor (iNAS).